A Foodie's Gift Guide | gingerbread smiles. A nice little home piece that you can give to your friends which is also very useful! The chopping board has lots of different kitchen conversions which will be brilliant for people who like to follow recipes. This is a great addition to anyone's kitchen! A hanging basket growing chillies that you can cut off and add to your cooking whenever you need. This is ideal for your friends who like a lot of heat in their food! For those people who like to change it up in the kitchen and try new things, this is for them. Well only if they are also burger lovers! This is a mix and match book where you can pair different toppings with unusual fillings. A great little stocking filler. Ever since seeing these on TV I've wanted to pick up a pack to try! They grow inside in a warm environment, i.e your airing cupboard, and they don't take much time at all. There grown in old espresso beans so I'm sure they would be very tasty! This would brilliant for someone who loves to grow their own vegetables. This is such a fun little gift idea. It's not something that people would go out and buy, but as a gift, they'd love it. You can customise the brand with whatever you'd like it to say... within the character limit. A quirky gift for a steak lover. Maybe they'll even offer to cook you steak if you get them this! 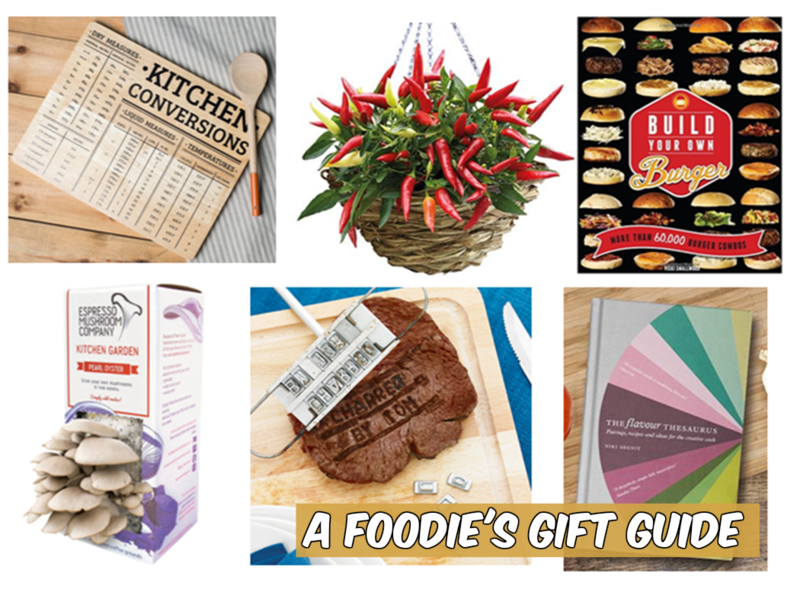 I was kindly sent the Flavour Thesaurus from Qwerkity to include in this gift guide, but only after I'd rigorously scoured the site for foodie gifts. This was definitely a winner! Although there isn't any pictures in this book, the content is brilliant. It goes through different ingredients detailing how they would go with other ingredients. It most certainly gives you something to think about when you have a read. Perfect for those who like to try something different in their cooking! If you are looking for gifts that are a little different definitely have a look at Qwerkity, they have Christmas gifts for men and women of all ages! Any of these take your fancy to pick up for your food loving friends and family? *Flavour Thesaurus kindly sent to me to include in this gift guide but opinions remain my own.